Paparazzi Accessories is a new direct sales company that makes being fashionable affordable. Everything we sell is $5! We provide women of every age with cute and trendy, necklace/earring sets, bracelets, earrings, headbands, hair clips, and rings. Paparazzi offers the "Starlet Shimmer" line which is geared towards younger girls and includes earrings, bracelets, rings, and headbands. 1 - ALL OF THE PRODUCTS ARE $5!!! Women can afford it and they LOVE the jewelry! No one sells quality jewelry at this price. Even Wal-Mart is more! 2 - THE COMPANY IS NEW!!! That means you can possibly be the only consultant in your area. Imagine the demand when people know you sell $5 jewelry! It's also a great way to build your own team and be a leader! 3 - 45% COMMISION!!! For each piece you sell for $5 you make $2.25. That adds up WAY fast! And also, when you have people join your team, you make 5 - 10% of what they purchase through the Paparazzi website. It all adds up quickly! Unlike other direct selling companies, you can sell Paparazzi just about anywhere! 1 - Home Parties. At home open houses, people come ready to buy. They come knowing they are going to buy at least one item. They bring their wallets! Some might bring their daughters or friends too. 2 - Office Visits. Women who work love Paparazzi. Most of them need to look professional for their career. Paparazzi is an inexpensive way to add some "professionalism." Take a basket of jewelry into businesses where women work and sell during lunch breaks or even leave items there for a few days. 3 - Basket Parties. Give a basket of items to a trusted friend or family member. Have them take it to their work, family reunions, or anywhere to show/sell to their friends, family, co-workers, etc. When they sell jewelry they will earn free jewelry and you earn money! 4 - Fundraisers. Raise the price to $6 (still affordable) an donate $2 of each piece sold to whatever cause you are supporting. This is great for school teams or clubs, cancer research, women's shelters, extracurricular activities, and more. You can have a display at an event or give baskets to the people involved with the fundraiser. I have examples and helpful forms specifically for fundraisers. Let me know if you would like them and I will email them to you. 5 - Boutiques, Events, Fairs, Flea Markets, Garage Sales, Online, etc. These are all great opportunities for get new contacts, book parties, sell tons, and maybe even get new team members. 6 - Retail Businesses - Paparazzi is different in which they allow retail stores to carry and sell Paparazzi accessories. You can do it on consignment or your business can join as a consultant/distributor. 7 - Sell at your Home. Some Paparazzi Consultants always have their displays up in a room in their home. That way, they are always ready for customers at any time! 8 - Trade. You can trade your jewelry for services from other people. This works well for haircuts, manicures, and other services and products. 9 - Build your own team. People who are interested in Paparazzi and want to sell it themselves can join your team. It is great to make your own team so that you can help other people succeed with Paparazzi. You also get the added bonus of earning commission on what they buy. With the economy the way it is right now and with all the people losing their jobs, there are many people looking for a way to make a living. Or maybe they just want to supplement their household income so that they can provide vacations, extra spending money, or make ends meet. When you are doing parties, conventions, anywhere, make sure you tell people about the Paparazzi experience. I know consultants who make Paparazzi their sole household income. Husbands have quit their jobs because their wives are earning more than they did at their daily jobs! So share this information to customers or people that are out of work. Tell them about my website, www.fashion5jewelry.com so they can find out more what they need to know. When they decide to join Paparazzi, they will join under you and be a part of your team. You will then get to help them succeed in this business. It is so fun to hear other team members stories! It motivates you to get more team members. You will be so excited about Paparazzi, you will want to share it with everyone! When they join with a starter kit, you will get $30 plus 5% - 10% of whatever they buy from the Paparazzi website. It all adds up! And then your team member will start recruiting to start their own team and you will get the benefits of that too. Paparazzi Consultants buy the accessories and jewelry they want to sell on the Paparazzi consultant site. They pay a wholesale price of $2.75 for every piece and then turn around and sell those pieces for $5. That is a profit of $2.25 per piece. You make that profit as soon as you sell it. There is no waiting for a monthly paycheck! You can see your profit right away! When you order more jewelry, think about your customers. What sold well during your last show? What color are you low on? Do you need more diversity in your collection? Take all of these into account so that you can get the most out of your business. Paparazzi rotates their inventory constantly. This is great because the jewelry is up to date and fashionable. Customers seriously become addicted to Paparazzi. They are always excited to hear that you have new inventory! The best way to get started is to buy a Starter Kit. There are 4 kits available to choose from. In order to be successful from the get-go it is important you have a wide variety of different items and colors. Paparazzi hand-picks what goes into these kits so that you do have that wide variety. It helps out SOOOO much! I highly recommend getting the $300 or $700 kit. I would only get the more expensive kits if you plan on doing a large event soon. With the $700 you can expect to be able to do 2 to 3 shows without having to reorder. You will also get a great sense of what sells well. Customers love Paparazzi for the huge selection and variety of the items. If you decide to get one of the $300 kits, please consider adding items to your order so that your total is at least $400. At $400 shipping is free. Some things to consider ordering with whichever kit you purchase is the Starlet Shimmer Collection. I would purchase at least one set of bracelets, earrings, and rings. These sell well. I also recommend buying a few yard signs. These will let people know where the party is! These items DO NOT come in any of the Starter Kits. So make sure to add them to your order! There is another way to join. You can pay an enrollment fee of $40. This only gets you a consultant ID# and access to the Consultant Website. You are sort of left on your own! With any of the kits you get a book that guides you along the start of your business. I found it to be very helpful and I still refer to it. I want to see you succeed. That is why I am pushing the Starter Kits so much. The enrollment fee is waived when you buy a kit. Most people who only pay the $40 have a hard time getting their business going. They have to sell 20 pieces to break even. So that is why Starter Kits are the best way to go, it saves you money. After your initial sign up, you can order anything you would like from the Paparazzi Consultant website. There are typically 800 - 900 items to choose from. All the pieces come in sets of 5. They are mostly organized by color. For example you can purchase a red necklace kit which has 5 different styles in it. There are pictures of what styles come in each kit. So you know what you are getting. This applies to all the accessories and jewelry. Each kit costs $13. 75. When you sell them for $5 you will collect $25. The profit you receive is 45%. Order as much or as little as you want. There are no mandatory amounts you need to meet. If you want to keep the title of "Active Consultant" you need to order at least 25 pieces in the month you want to be active. You need to do this also if you want to receive a check from your down-line purchases. 25 pieces is about $72. Being "active" has its perks. Your name will show up on the Paparazzi Consultant list on the Paparazzi website. This is an awesome thing because there have been a bunch of parties booked or people wanting to join. All orders over $400 receive free shipping. All orders under $400, the shipping is $10. Plan ahead and make sure that $10 shipping is worth it! Shipping Time Your order ships from Paparazzi which is located in Southern Utah. They usually package your order within 24 to 48 hours after you place it. They then shop it to your door using UPS. I live in Western Washington so I get my orders in 3-4 days. It all depends how long it takes UPS to ship to where you are located. Read the Compensation Place HERE. Read the Policies and Procedures HERE. Ready to become a Paparazzi Consultant? 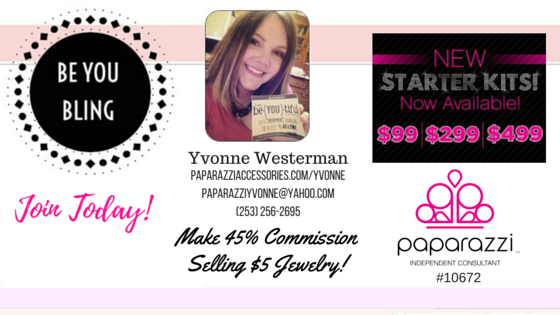 Click here to join my team and start your own Jewelry Business today!